Be on the lookout for some unscrupulous third party sellers on Amazon who are working hard to steal your dough. 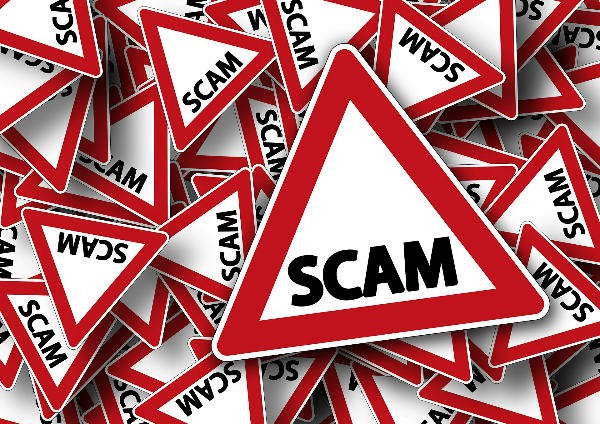 I know someone who was almost scammed out of $500 due to this scam – an extremely intelligent, tech savvy person. Third party sellers have been a mainstay on Amazon for years, offering both used and new products alongside Amazon’s own listings. You can sometimes snag a great deal by choosing a third party seller. I’ve sold items on Amazon as a third party seller for many years, and most sellers are honest individuals and business people. However, some sellers are boldly using Amazon to scam unsuspecting customers out of hundreds of dollars. Here’s how to spot and avoid the Amazon third party seller scam. 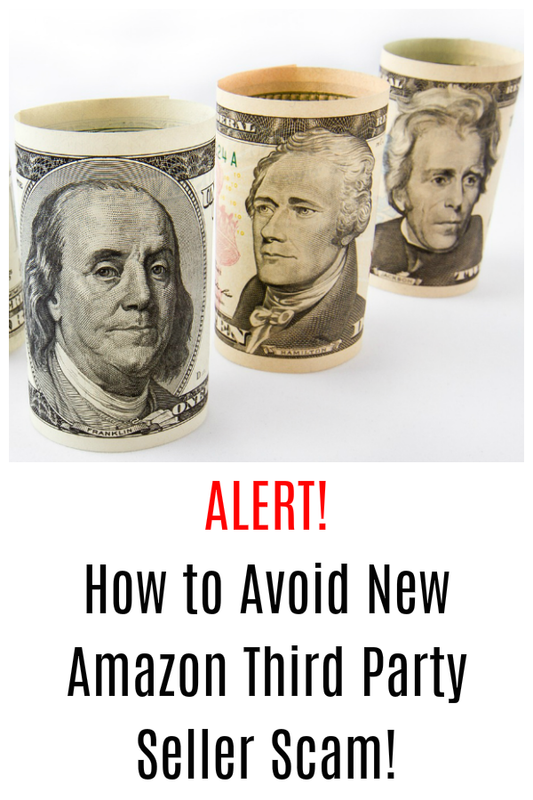 If you shop at Amazon much, you’ve no doubt noticed that you often have the opportunity to buy items from third party sellers – other companies or individuals selling their wares through Amazon. The new third party seller scam works like this. A third party seller lists an expensive item for sale at a great price compared to other options on Amazon. The seller’s comments on the item list an email address that the buyer is supposed to contact before purchasing. The buyer, lured by an extremely sweet deal, sends a message to the email address. The seller replies with instructions for buying an Amazon gift card to pay for the purchase and claiming that the purchase would be covered under Amazon’s A to Z policy. The buyer agrees and receives another email that looks almost exactly like an actual Amazon order confirmation email, except that it asks for Amazon gift card numbers and a screen shot of the gift card in order to complete the purchase. The email contains links to an email address that kind of looks like it could be affiliated with Amazon, such as auto-confirm@payments-amazon-services.com. When the customer looks up her order on Amazon.com, it’s not there. When she contacts Amazon Customer Service, they have no record of the order. 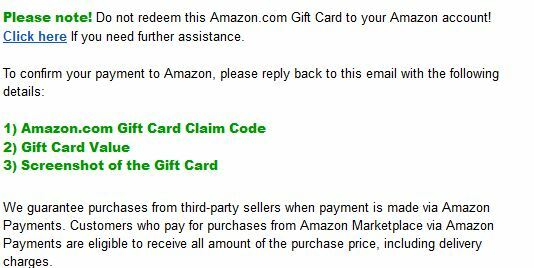 Considering how many different things you can buy on Amazon, giving someone an Amazon gift card is almost like handing over a wad of cash. Smell a rat if a third party seller wants you to email them prior to purchase. 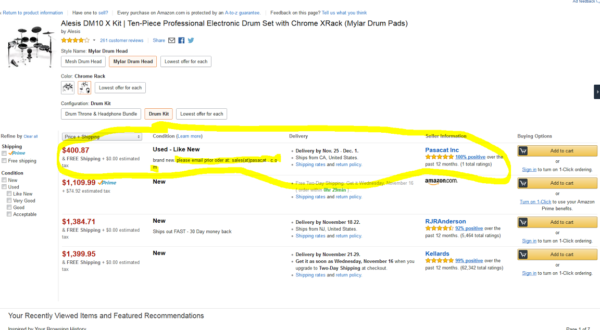 There are ways to contact a seller through Amazon prior to purchasing if you have a question. However, there’s no valid reason for third party sellers to require email contact ahead of a purchase. Never conduct an Amazon transaction outside of Amazon, whether by credit card or gift card. The contract that third party sellers have with Amazon requires all payments to be made through Amazon Payments. Sellers should never ask you to do otherwise. If a deal looks way too good to be true, it probably is. Something’s fishy about a third party seller offering an item for $500 when all other sellers are asking $1100 or more. If you do fall victim to an Amazon scam, contact Amazon’s customer service directly right away. You can call (888) 280-4331 or click on the Contact link on Amazon.com. 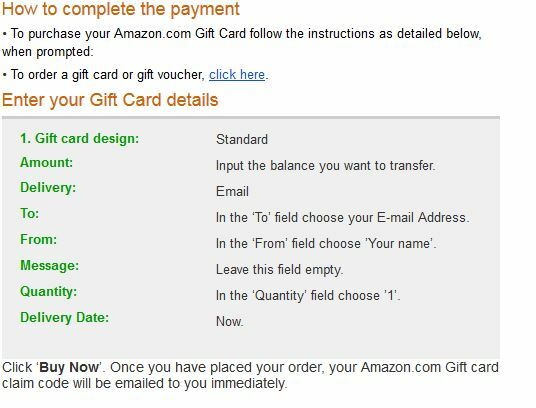 In my friend’s case, Amazon was able to void the gift card purchase so she didn’t lose any money, but it was a close call. She gives high marks to Amazon’s customer service for catching the odd transaction and working with her to get it reversed. 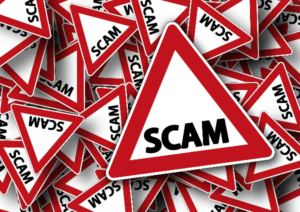 Have you been scammed by an Amazon seller?